Very cool updates. 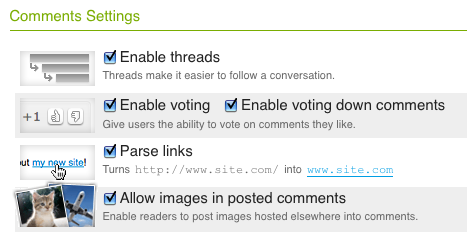 The moderation option is especially useful. I think it's because you're currently logged in using your WordPress.com account. If you logout of WP.com you should be able to login with your ID account. 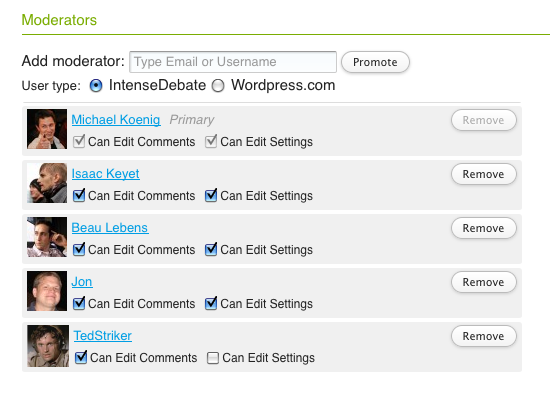 You can logout at http://intensedebate.com/logout – it'll just be a blank page. Then login at http://intensedebate.com/logmein and let me know if the issue persist. The next phase of integration is to merge the two accounts. Sorry about that. Yes. That was it. Problem is that it's not immediately obvious on the IDC dashboard or when leaving a comment with which service I'm logged in as. Thanks for the heads-up. We're taking a look at some possible ways to improve it until the merge is finished. Hey, can you add an option to have the reply button right under instead of left under? Is there a way a person can stay logged into ID for a week or so at a time? Can this feature be added as an option when someone is signing in ? That way you aren't being asked to sign in day after day. Please check and make sure that you have third-party cookies enabled in your web browser preferences. That should do the trick. Managing multiple installs of ID on WordPress MU, I've now LOST the ability to tweak settings because ID doesn't recognize me as the admin for the account. How do I torch ID of my blog, and my account on ID and reset the whole damn thing? Sorry for the frustration. This should be corrected now. Sorry for the inconvenience. Thank you. Everything has been working great.